← When is the right time to undertake doctoral research in surgical training? As an addition to previous blogs on how to choose a research project and timing of research I thought it might be useful to give some data from our department here in Edinburgh. We currently have 21 research fellows (6 women and 15 men) and their chosen subspecialty areas of interest are given below. 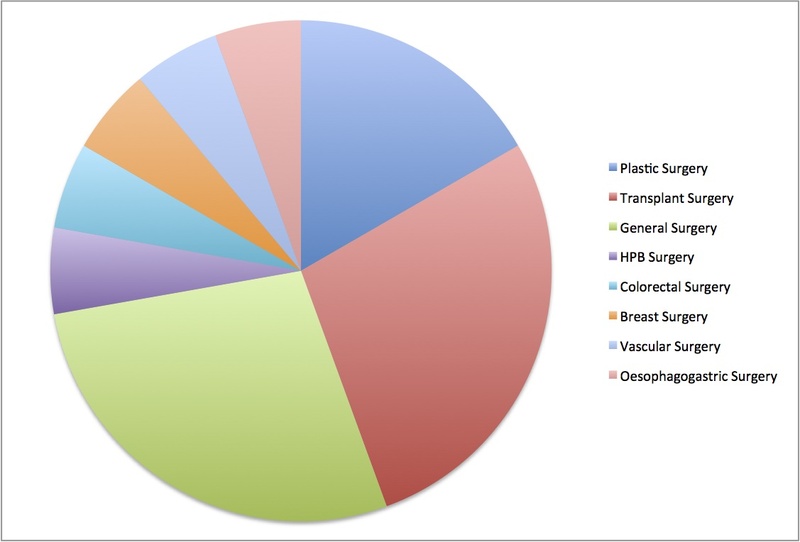 There are a relatively high number of trainees interested in transplantation surgery and this reflects the current strengths of the department in terms of research active personnel. The trainees grouped under the heading of “general surgery” are those who are not currently sure what their ultimate subspecialty interest will be. The only other aspect of this chart is that I am pretty certain that at least some of the subspecialty interests will change by the time these trainees become consultant surgeons. Please also note that this represents only the trainees currently holding research fellowships undertaking PhD or MD degrees. 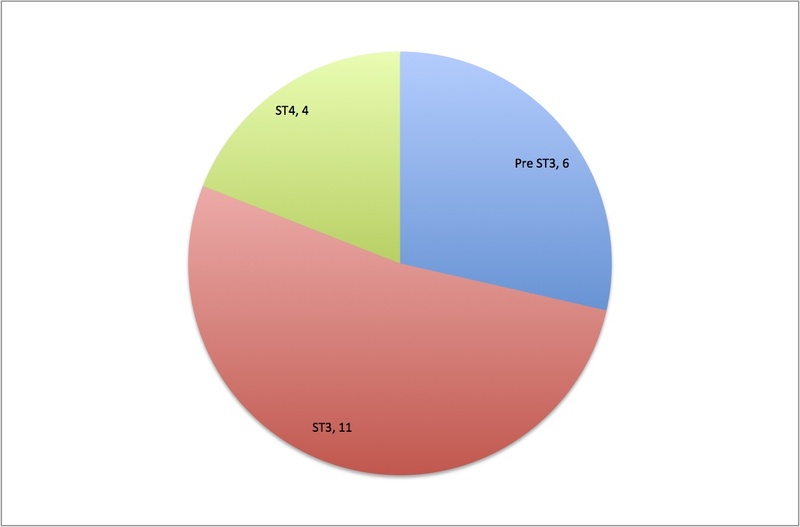 Our current portfolio of research fellows are at varying stages of clinical training and as I mentioned in a previous blog about timing of research they tend to differentiate into those who are using research to strengthen their CV to get on to specialty training (shown on the figure as pre-ST3) and those who hold training numbers ST3 or ST4. The number refers to years of training so ST3 is year 3 of training out of a total of 8. 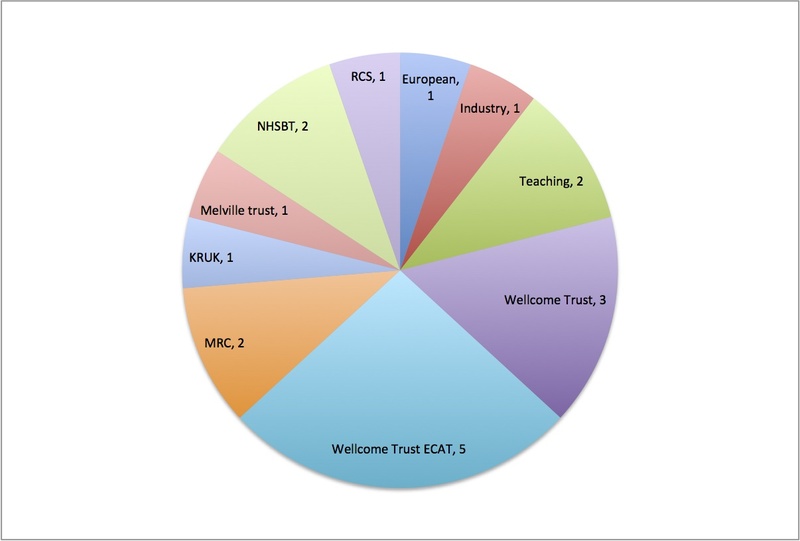 In terms of the funding for their research, more than half of our fellows have been awarded funding from research councils and the rest are from a mixture of charity, industry, teaching associated posts and Government Organisation funding. The research council fellowships contribute more to the running of the University as they routinely pay overhead costs for heating, lighting etc. In terms of their registered degree, 14 of our 21 research fellows are undertaking a PhD and 7 an MD. (For any USA colleagues reading this, in the UK medical graduates qualify as a doctor with the basic degrees of Bachelor of Medicine and Bachelor of Surgery degrees (MBBS or MBChB), MD is Doctor of Medicine and is a postgraduate research based doctoral degree). 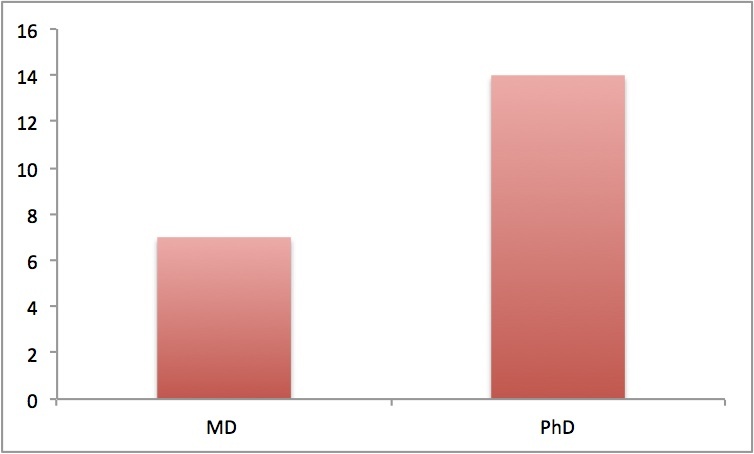 There has been a clear shift, at least in our department for surgeons to undertake PhD more commonly than MD. This may reflect the fact that our department attracts individuals who wish to pursue a career in academic surgery and also the high value that is placed on academic endeavour among surgeons in South East Scotland as a whole. These data are not sensitive and are designed to give a picture of the demographics of current surgical trainees at least in Edinburgh and South East Scotland. I hope that this is helpful. This entry was posted in Research matters. Bookmark the permalink.